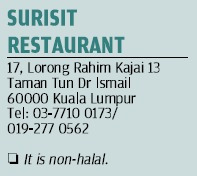 Surisit may look like a Thai kopitiam but it offers Thai dishes that have a home-cooked feel and quality. THE Salted Dry Beef has sesame seeds clinging to the dark slices of meat and deep-fried crispy kaffir lime leaves and cili padi topping it. Dipped into the hot, sour and sweet sauce, it unleashes a mouthful of flavours. We are enjoying this at Surisit, a Thai kopitiam in Kuala Lumpur. It is styled as a kopitiam in appearance, as it has panels of raw wood for the main door and an old-fashioned iron grille gate. On the shelves are old-fashioned bottles of fizzy drinks and coffee cups. The crockery has an orange rooster imprinted on them and you can get a cup of local coffee here, as well as Thai noodles and porridge. But Surisit is a full-fledged Thai restaurant, with a menu that is constantly evolving. For our dinner, we have Salted Dry Beef, Cha Om Omelette, Banana Flower Salad, and Udang Galah with Thai Tamarind Sauce. ‘The Thais eat a lot of pork, not so much beef,’ says Sita Jayadev, owner of Surisit restaurant. Cha Om is a frond-like vegetable with a faint petai aroma and a slight bitterness if you eat it raw. But in a fluffy omelette, and served with a Thai eggplant sambal, it is delicious. The Banana Flower Salad is not on the menu, but you can ask for it. We had this salad on a previous occasion and liked it so much we ordered it again. The salad is presented on a large dark red petal of the flower: the tender blossom is shredded and combined with prawns in a Thai dressing of lime juice, fish sauce, palm sugar, coconut milk, chilli and shallots. 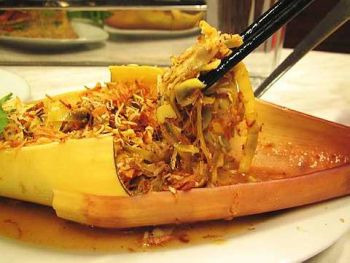 It is generously topped with kerisik (toasted grated coconut) and fried shallots. Sweet and sour are in a fine balance: the blossom juliennes crunch against the crispy shallots and kerisik. We also like the deep-fried udang galah smothered in a Thai tamarind sauce. The tamarind is cooked with palm sugar, rendering a sticky sweetness with a hidden tartness. The prawns, cooked with lots of crispy fried shallots, a deep-fried cili padi or two, are perfect. The same tamarind sauce is also in the Son-in-Law Eggs, deep-fried hard-boiled eggs, which are simple and tasty and meant to send a message to an erring son-in-law. The Banana Flower salad– sweet and sour in fine balance. But what attracts at Surisit are the pork dishes. 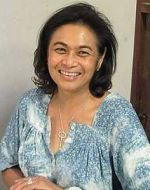 Sita used to be a partner in Montien, a Thai restaurant in One Bangsar Kuala Lumpur. She took a hiatus from the restaurant scene, and for the next five years was wedding planner and caterer for close friends and family. Her nephew Rivon persuaded her to open a Thai restaurant, and that’s how Surisit came about. I order the Tomyam Ka Moo, which is a clear soup with braised pork hocks and abalone mushrooms. These have been braised in a dark sauce with cloves and star anise. You get a hint of the spices in the meat. Somehow the spiced pork works well with a sour-and-hot tomyam; it makes you appreciate the meat more. The braised pork hocks also come in a claypot as a separate dish. Sita turns out a yummy Belacan Fried Rice, garnished with julienned mango, cili padi, fried dried shrimps, sliced shallots and slices of fresh lime. 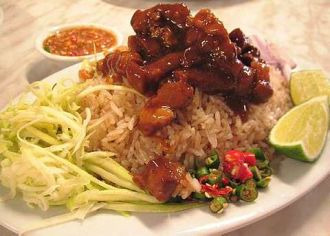 Slices of pork cooked in dark sweet sauce is poured over the rice and stirred up. The shiny grains of rice are redolent of shrimp paste, and it’s carbs you don’t mind having a lot of. There are also BBQ Pork Salad and a Stirfried Petai with Shrimp Paste and Pork. Another outstanding dish is the Crispy Fried Pork with Shrimp Paste and Deepfried Lime Leaves with Chilli Sauce. 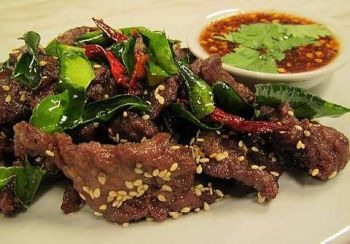 Slices of meat marinated in shrimp paste are deep-fried and topped with crispy kaffir lime leaves. The aromatic, crispy pork is scrumptious dipped in a tasty chilli sauce. 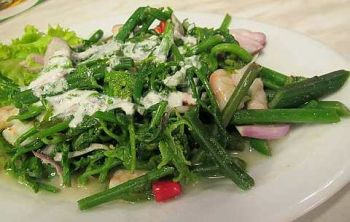 As for vegetables, the Kerabu Pucuk Paku is a must – young, crunchy jungle fern shoots tossed in a hot, sour and sweet lime dressing with fish sauce, and drizzled with coconut cream. I have been back to the restaurant on several occasions, and each time I find something new to eat. Next time, I’ll try the Thai Laksa, and the Mango Salad with Catfish. 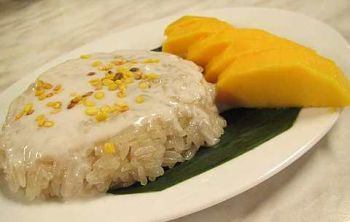 Desserts are the popular Glutinous Rice with Mango, Tab Tim Krob and an icy treat of palm heart, lychee and sea coconut. Surisit also serves breakfast on weekends when it opens at 9am; it’s 11am on weekdays. You can have Thai Noodle Soup with pork balls and minced pork, Thai Fried Kwayteow and Pork Porridge, served with coffee or tea, for RM8.50.